NYC, 02/07/2019, 6:30PM. 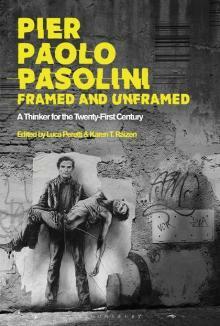 Pier Paolo Pasolini, Framed and Unframed: A Thinker for the Twenty-First Century. This cross-disciplinary volume explores and complicates our understanding of Pasolini today, probing notions of otherness in his works, his media image, and his legacy. Over 40 years after his death, Pasolini continues to challenge and interest us, both in academic circles and in popular discourses. Today his films stand as lampposts of Italian cinematic production, his cinematic theories resonate broadly through academic circles, and his philosophical, essayistic, and journalistic writings-albeit relatively sparsely translated into other languages-are still widely influential. Pasolini has also become an image, a mascot, a face on tote bags, a graffiti image on walls, an adjective (pasolinian). The collected essays push us to consider and reconsider Pasolini, a thinker for the twenty-first century.